Yesterday none of the school age children had classes so everyone was here for the full day and the weather was amazing. The weather channel reported a high of 17° C but with the sunshine the thermometer in my back yard registered 22° C – beautiful. We spent all morning outside. As usual there was a lot of ‘cooking’ going on since collecting items and making concoctions are very popular activities. It was one of those days that I wish I had brought the video camera out since the ‘action’ is missing from the still photos. The camera and I both have slow reaction times so what shows up in the pictures isn’t always what I was trying to capture. I spent a considerable amount of time observing the process involved in adding ingredients to this pot. 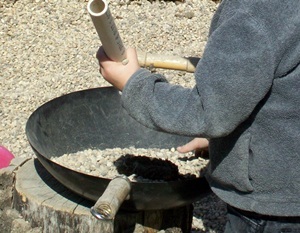 Fine motor skills were enhanced as pebbles were dropped one by one through the tube and into the pot. It took more trial and error and a little frustration to discover why the ones placed in the bottom of the tube didn’t come out the top. While we were out in the yard we cleaned up the garden area a little and picked some weeds. 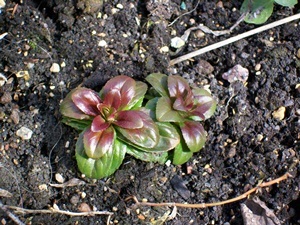 We found some plants that we couldn’t identify – probably weeds since there shouldn’t be any perennials planted here – but we thought were pretty so we left them to grow more. On the hill the Yarrow and the Giant Hyssop are beginning to sprout. I am so excited that they seem to be off to a great start. 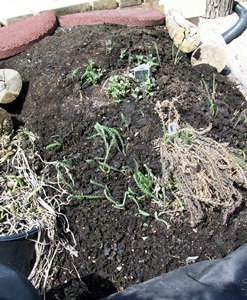 I’ve managed to kill off many other plants even though I’d been told that they could survive in difficult situations. Now I’m a believer in the power of native plants. Of course we also engaged in some great gross motor activities outside too. Running and jumping, ball games, hide and seek and tag. My son joined us for a while and practiced some more Parkour moves and balance games. 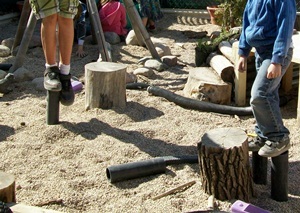 While he tried to balancing on a piece of pipe one of the preschoolers observed and then modified the activity to suit his comfort level. Today it is raining and there is a winter storm warning. Some of the highways have been closed due to ice and snow. We will remain optimistic. We have had a taste of summer and we know it will be here – eventually.